You might wonder why I would spend a whole blog entry on something as boring as commuting. But it is a special experience here in Tokyo. My apartment is located in a nice, traditional neighborhood on the outskirts of Tokyo and thus I have to take the train and the metro every morning. The first remarkable thing for a foreigner on this way is the strict organization. Firstly, there are signs that indicate which side of the stairs to use for going up- or downstairs. 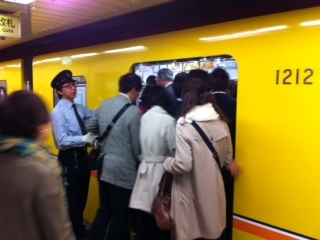 Additionally, there are specific spaces to queue for boarding the trains. When a train arrives everyone steps aside to let the passengers debark. This sounds so wonderfully organized for us foreigners, but honestly, without all the signs and rules the sheer mass of people would cause a tremendous chaos. 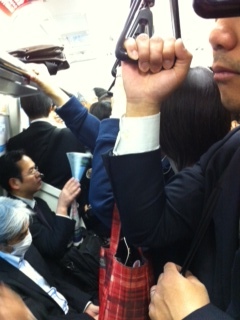 The next fun thing about commuting in Japan is that during the rush hour all trains are packed – I mean really packed. At the big stations (almost all on my way to work) there are nice officers who kindly help the passengers to enter even if the train is already completely full. Nevertheless often their assistance is not even needed because the experienced commuters push and squeeze themselves into the over-full trains. The comfortable thing is that no one has to care about holding handrails or carrying bags – there is just no chance to fall over or for the bag to fall down. Some hints for the stranger in this mass: In the train, do not stand directly at the door, the handrail or any other solid thing as this might hurt when being pushed against it. 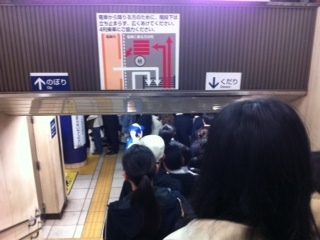 Pay attention to the moment when all passengers have debarked and the mass on the platform moves towards the doors. You might lose control over yourself and be pushed against the train. Besides, it is really helpful to make extremely small steps in the big masses of people as this is the fastest way to move smoothly. Do rather not look at your cellphone while moving as you will likely bump into somebody. 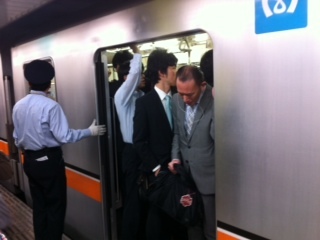 Finally, if you as a woman are afraid of touchy (Japanese) men most trains have women only cars during the rush hour in the morning. Those are usually located at the front or the end of the train. After the commute you can easily enjoy a relaxing coffee (to go) in one of the countless coffee shops here. One might believe that Japan is a country of tea drinkers, but at the same time coffee is really popular. At most metro stations you can find shops of all major chains, like Starbucks, Tully’s and Doutor. Starbucks has an amazing number of 269 stores in Tokyo. Therefore, however packed the train was, afterwards a coffee at hand is guaranteed. This entry was posted in Uncategorized on May 9, 2014 by Katharina. My internship is in the representation office of ThyssenKrupp in Japan and I work in varying projects for the representative and with ThyssenKrupp Otto. Just to give you some ideas on the widespread topics: So far I have got some insights in HR, project controlling, business development and procurement. Besides the contents of the work every day I find out more about cultural differences and how discrepancies in cultural backgrounds can complicate communication. But culture will be the topic of yet another post. First I would like to briefly introduce you to ThyssenKrupp in Japan. The representation office is located in the TK casa in the center of Tokyo, where the five group companies in Japan have their headquarters. In total there are about 120 people in Tokyo with roughly another 200 at production sites. ThyssenKrupp builds on a long history in Japan. As early as 1903 locomotives were supplied by a predecessor of ThyssenKrupp. Still today ThyssenKrupp Japan is primarily active in three competency fields: Renewables, Defense & Security and Automotive. These competency fields are handled by five business units: Firstly, there is Nippon Roballo which produces slewing rings and bearings (with two production sites in Japan). Moreover, ThyssenKrupp Otto is active in the coke plant and incinerator business. Another branch of ThyssenKrupp in Japan is ThyssenKrupp Access which sells stair lifts to the Japanese market. Besides, ThyssenKrupp Steel & Technologies offers trading and engineering services to the Japanese market and ThyssenKrupp Presta supplies components to Japanese car manufacturers. Finally, the representation office is an overarching office representing the whole ThyssenKrupp company, especially all local branches, in the Japanese market place. This entry was posted in Uncategorized on April 18, 2014 by Katharina. My first week here in Tokyo was characterized by cherry blossoms everywhere. 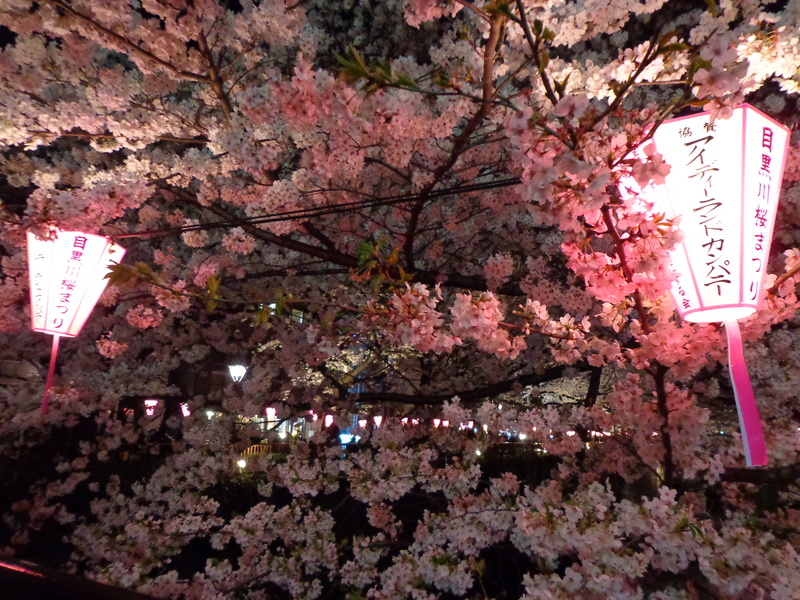 I was lucky to arrive in Japan exactly at the right time to experience the wonderful time of sakura. The trees bloom and show their transitory beauty only for about two weeks at maximum. Thus, the sakura blossoms are seen as a symbol for the transience of life. At the same time their sheer beauty is admired by the Japanese and tourists alike. Cherry trees are spread over the whole city of Tokyo changing unimpressive streets and squares to beautiful meeting places. One might even get the impression that almost every second tree is a cherry tree. Japanese people use this time of the year, also considered as the beginning of springtime, to do “hanami” parties which are picnics with friends, family or colleagues beneath cherry trees. 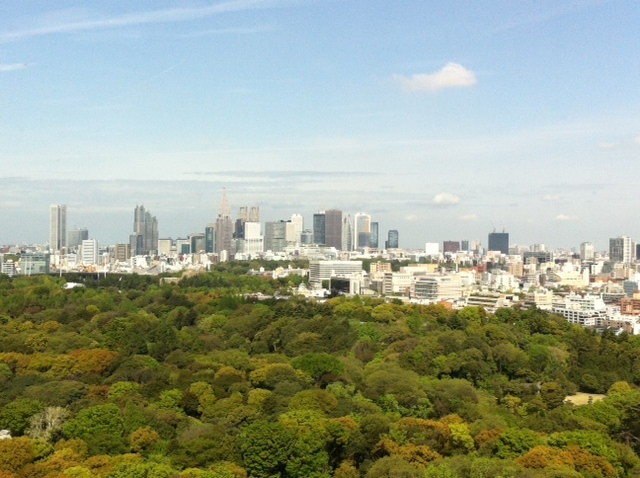 Thus, the parks most famous for hanami are really crowded. 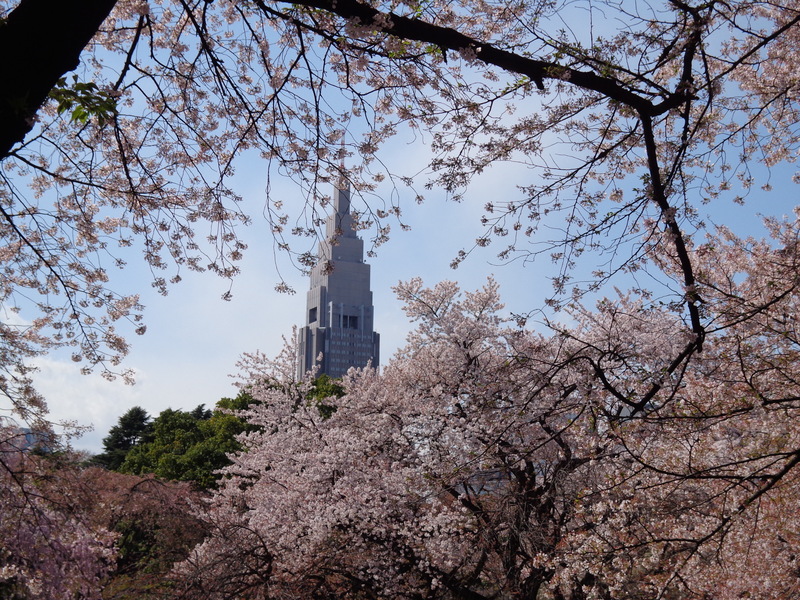 In order to get the best sakura viewing spots many groups reserve their spots early in the morning with blankets and labels or send their youngest members to reserve personally. At hanami parties food is shared and one may try cherry blossoms flavored wine or hot wine. Also at some spots traditional music, dance performances and food will be offered. 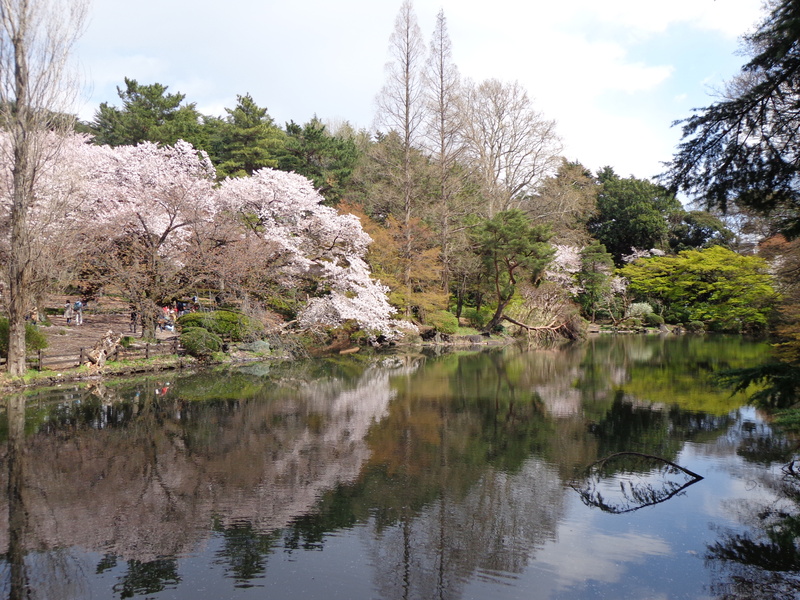 Also for tourists this is a great time to experience Japan as all the parks are even more beautiful under the clouds of pink and white blossoms and the mood at hanami parties is usually good and extraordinarily open-minded. Just one thing should be kept in mind: Never walk with your shoes onto the blankets used for hanami parties. Similar to Japanese houses where there are designated barriers after which outdoor shoes are prohibited it is considered rude to wear shoes on the blanket where people sit and eat. This entry was posted in Uncategorized on April 12, 2014 by Katharina. My name is Katharina and I am a student in the Master of Management at Mannheim University. I have taken part in Blind Applying and got the unique opportunity to be part of an international internship. The surprise about the internships offered and the number of interesting companies which took part convinced me to apply. For two months I will work as an intern at ThyssenKrupp’s representation office in Tokyo, Japan. I am looking forward to getting involved in exciting projects and to experiencing the Japanese culture in work and daily life first-hand. 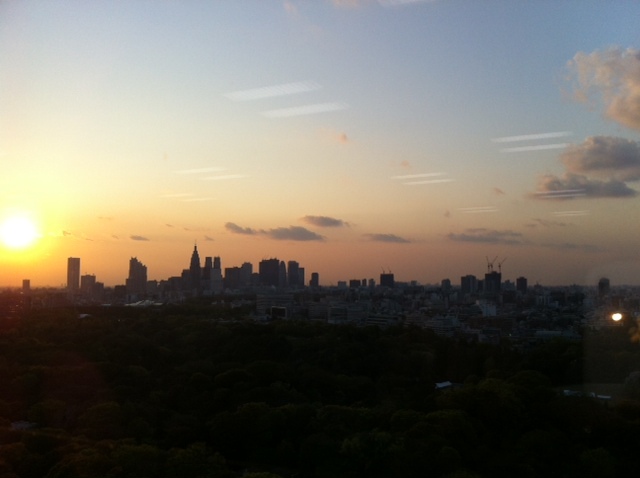 With this blog I will keep you up-to-date and give you insights into my internship, ThyssenKrupp and the life in Tokyo. Do you want to take part in Blind Applying as well? Or would like more information, go to: www.blindapplying.com or feel free to post your questions here. This entry was posted in Uncategorized on March 29, 2014 by Katharina.